Coach Murray is the BEST! Center Street School has been named a California Green Ribbon School. 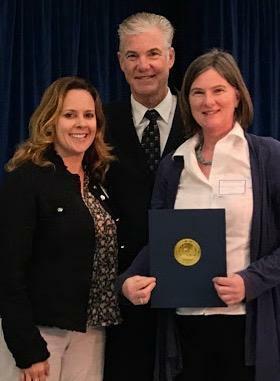 PTA president, Tracey Miller-Zarneke and our principal, Ms. Monahan, accepted our Bronze Level award from State Superintendent of Instruction Tom Torlakson at a statewide event. Changes that we have made to our practices, including: recycling, composting, eliminating single use water bottles, planting drought tolerant gardens, encouraging walking to school and trash free lunches all contributed to our eligibility for this award. Only 17 public schools in California received the CA Green Ribbon School Award - so we feel very proud of our accomplishment. Our Green Team and all of the ecologically minded faculty, parents and staff continue to build earth consciousness in the next generation of citizens of our planet. 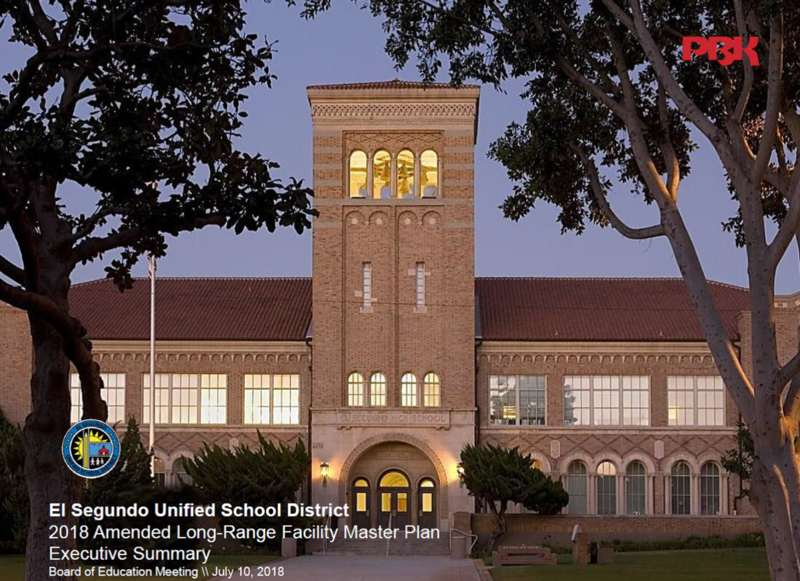 Please follow this link for a thorough report on plans for all El Segundo schools maintenance and improvement. Congratulations to the following students who have been recognized for their entries in the 50th National PTA Reflections Reflections contest: Visual Arts – Primary Antonio Cotrufo - Award of Excellence 3D Ella Pak - Award of Excellence 2D Cooper Quinnan - Award of Merit 2D Michael Saenz - Award of Merit 3D Visual Arts – Intermediate Eamon Bucknell - Award of Excellence 3D Chase Lai-Yates - Award of Merit 2D Bennett Lee - Award of Excellence 2D Photography – Primary Kaila Davidson - Award of Merit Cohen Liberty - Award of Excellence Photography – Intermediate Emory Bucknell - Award of Excellence Ellen Dull - Award of Excellence Kapish Joshi - Award of Merit Dance Choreography – Primary Liam Davidson - Award of Excellence Dance Choreography – Intermediate Danny Smith - Award of Merit Rebecca Snow - Award of Excellence Music Composition – Intermediate Roland Hoffman - Award of Excellence Danny Smith - Award of Merit Literature – Primary Naomi Kenton - Award of Excellence Literature – Intermediate Auriana Barragan - Award of Merit Supe Shreyas - Award of Excellence Film Production – Intermediate Nola Davidson - Award of Excellence Danny Smith - Award of Merit All first place entries have been forwarded on to El Segundo Council for recognition. We are so proud of these talented Cougars! Center Street Students CLEANED UP in this year’s Rotary/ESFD Fire Safety Poster Contest taking five out of the nine top awards! This year’s CSS winners were: Nola Davidson Malia Kenton Sophia Mahmoud Molly McAndrews Ethan Relles Julia Zhang Congratulations to these talented artists – and thank you to the El Segundo Rotary Club and the Firefighters for the opportunity. Every student wins through programs funded by your donations to the El Segundo Education Foundation (Ed!). For only $34 a month ($400 a year), you will make a difference at the CSS by helping to fund elementary programs such as: CGI – Math (DIRECTV), Computer Science (Boeing), Library, Literacy Specialist Support, Physical Education (Skechers), STEM (Chevron, NRG), Art and Spanish. This year, the El Segundo Unified School District has asked the community to step up and help fund additional programs. We’ve accepted the challenge with a pledge to raise a $1.3 million grant and need your help! Make your annual donation today at www.ESEdF.org For ‘extra credit’ become a Superintendent’s Roundtable member by donating just $100 a month. Every student wins through programs funded by your donations to the El Segundo Education Foundation (Ed!). Go to www.ESEdF.org today. CSS has a beautiful stained glass cougar welcoming families to our school. The work was designed by Janet Read (“retired” CSS teacher and mother of Presley) and crafted by Michael “Percy” Pirsztuk of The Glass Idea Co. in El Segundo. Thank you to PTA for helping us make this a reality – and YES our cougar is sharing his habitat with a blue butterfly! We are united in nature and in our El Segundo community. We invite you to join us for Trash Free Tuesdays by clicking on this link and picking a Tuesday (or two) that you can volunteer during the lunch period which runs from 11.00 am - 1,15 pm. You can sign up for one hour or the whole time - we would love to see you there, and so would the kids! We also welcome help Thursday and Friday afternoons to help pack up the Terracycle juice pouch collection and/or to mix the compost. We collect the following items to divert them from the landfill: juice pouches, ink jet containers, used crayons and used markers. Please deposit these items in the Grades of Green box in the quad at your convenience. At Center Street School, we value and care for each and every student. Within a safe and compassionate learning environment, students take ownership in their role as scholars and are empowered to achieve at their highest level. Through creativity, collaboration, and critical thinking, children enjoy the process of becoming problem solvers and lifelong learners.